If the time has come for you to sell your home, we have a few helpful strategies that should make this process run as smoothly as possible. A seller’s worst nightmare is to have their home listed forever and never make a deal. As your local Guelph real estate agent, I can provide 5 tips to help you quickly sell your home and prevent that fear from becoming a reality. Whoever said, “Don’t judge a book by its cover” was clearly not talking about a house. A home’s curb appeal could be the first and only impression it makes on a potential homebuyer. Therefore, it is important that you make the home look as presentable as possible. This could be done by installing a new roof, fixing any chipped paint or removing dead flowers from the yard. The more appealing your home looks the more likely a buyer will stop and look around. When your house is being viewed, stage it appropriately so the buyers can envision themselves living there. In many cases, this may mean depersonalising your home to some extent. Most homebuyers do not want to see your family photos or personalised items in their potential home; remove all unnecessary items so they can picture their family there instead. In addition, make sure all the furniture is in an appropriate place, and that the whole house has been deep cleaned. Nothing will turn away a buyer faster than having an unorganised, dirty home. The real estate in Guelph is competitive so be reasonable with your listing price. Homebuyers are aware of the current market trends so don’t try and oversell. If you do not price your home appropriately from the start, home buyers could avoid viewing your home and you could risk the chance of making a sale. As experienced Guelph real estate agents, we are experts on the market and at pricing homes. We can help you get the most money for your home, in the shortest amount of time. When selling, make sure your home is listed on all the major online sites. The more popular the website, the more viewings your home will get. Make sure all your photos online are of good quality because presentation is everything. One blurry photo could deter a buyer from wanting to see more. It will also be in your best interest to go above and beyond by adding helpful information about the neighborhood. This way buyers cannot only see what it would be like to live in your home, but to live in the community as well. We can help you make sure your home is marketed properly to the right audience! It is important to be flexible with your schedule. If you have someone who is interested in your home but can only view it at a certain time, be as readily available as possible. Having to constantly reschedule will discourage a buyer from wanting to make the effort of seeing your home and might look elsewhere. We understand that it can be difficult to always keep your home clean or have it available for potential buyers to view, but this will help make the process moving along much faster! Working with a real estate agent in Guelph can provide more insightful tips on selling your home. So don’t wait, reach out to Ann O’Garr today at 519-831-7447 or aogarr@remax.net or Wolfgang Dobrowolski at 519-831-7447 or wolfgangd@remax.net. Whether you need to relocate for work or you are purchasing a home closer to family or an excellent school, you have listed your home with the intention of selling it. Everyone hopes to sell their home in as little time as possible, and when that doesn’t happen, it can leave you wondering what is going wrong. While problems selling your home are definitely unwanted, there may still be some good news! In many cases, there are steps you can take to remedy whatever problem is preventing your home from selling.. The most common reason for homes not to sell as quickly as they should is an issue with the price. There is a great deal that goes into pricing a home accurately and that is for good reason. If you start out too high, even in a seller’s market, your home can sit on the market without any traffic. As Guelph realtors, we understand many people want to price their homes higher in the beginning as a way to “leave room” for negotiation. Our experience in the industry has shown us that this method of pricing a home just leads to longer time on the market and possibly even a lower selling price. By pricing your home correctly from the beginning, you are more likely to sell your home at a price that works well for you. If your home is currently priced too high, that could factor into why your home has not yet been sold. The condition of your home, especially in relation to price, will also have an important role in how quickly your home sells. If your home is priced according to the homes being sold in your local area, but it hasn’t been looked after in the way the other homes have, it isn’t going to sell. In situations where a seller’s home could use some “TLC” we recommend taking care of the more inexpensive jobs and adjusting your price to accommodate for anything that has not been taken care of. This will give buyers more of an incentive to purchase a home that they know will involve additional time and money on their part. How your home is being marketed to buyers is another thing you should take a look at if your home isn’t selling fast enough. Your Guelph realtor should be helping you stage, photograph and market your home to appeal to the largest number of buyers. While we may not be able to help you with issues involving your title or other things of that nature, we can definitely help you sell your home if price, condition or marketing are your issues. If your home hasn’t sold yet, it’s time for a change. For help selling your home, give us a call today! When it comes to real estate, whether you are buying or selling, there are a lot of terms that may be associated with each transaction. Throughout our experience working in the real estate industry, we have come across each of these terms countless times. This has helped us obtain a firm grasp of the meaning of each aspect of the process and allows us to better assist our clients as they find the perfect home or buyer in the Ontario region. We understand that, while it is crucial to work with an experienced real estate professional, many of our clients also feel more confident when they understand the process themselves. There are many common, and not so common, real estate terms whose meanings may not be as familiar as they should be. Below, you will find a list of a few of these words, along with a brief definition, to help you better understand each term. Amendment: An amendment is a document that states a change that has been made to a contract. This may include a correction, clarification, addition or deletion of a certain section or term of the contract. The contract must have been previously agreed to for it to need an amendment. If the contract has not yet been agreed to, changes may be made to it by either party and these changes, once agreed upon, will just be part of the contract itself. Appraisal: An appraisal is a formal, unbiased estimation of property’s value. It is most often issued in writing and must be evidenced by criteria relating to relevant property data. Chattels: Chattels are all the removable possessions that are not secured to or considered part of the real property. These possessions may include furniture, décor, and appliances. A common term that is often associated with this lesser known term is personal property. Closing: The process of closing on the purchase or sale of a property refers to the finalizing of the real estate transaction. During this process, all documentation is signed by all required parties, funds are properly distributed and keys are exchanged. Surveying: Surveying refers to the process of accurately measuring the boundaries and elevations of a certain piece of land or structure. A survey is taken during the home buying process to ensure that all parties are aware of the exact measurements of the property before the sale is finalized. Valuation: The process of valuation occurs when the value of a certain real estate property is determined. Unlike an appraisal, the process of valuation can be done through many different means, and is not necessarily a formal declaration of value, although it may still be helpful for things like pricing your home when you list it for sale. These terms represent only a fraction of the information that is involved with each real estate transaction, which is why we always recommend working with a real estate professional who is experienced and educated on each and every aspect of the process. 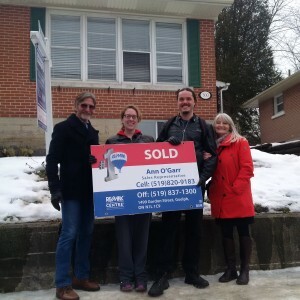 As Guelph real estate professionals, we are always happy to help people on the move! Give us a call today for more information or to get the process of buying or selling your home started now! Whether you are relocating for work, moving to an area with more options for your children’s education, or downsizing as you enter retirement, there will come a time when you are ready to sell your home. As trusted Guelph real estate agents, we want to help you understand the importance of preparing both yourself and your home before you put your house up for sale. The most important thing to consider when you make the decision to sell your home is who you will be working with throughout the selling process. Aside from deciding to sell your home, deciding on who you want to work with is the most important choice you will make because it can affect everything else! The right Guelph real estate agent will help you price your home, market your home and sell your home. Whether you choose to work with an expert or try to make a go of selling your home on your own, there are many factors that will need to be taken into consideration before you can accurately price your home. You and your agent or realtor will need to conduct research on the local housing market to see what the homes in your area with similar characteristics to your home are selling for. This will not only help you set a realistic asking price right from the start but will also give you an idea as to how long most homes in your area and price range are taking to sell. The process of selling will vary from home to home, but this relevant market data should give you a great starting point for your own process. It is important to remember not to overprice your home when you first list it on the market, as this can drag out the process which could have a large impact if you have time limitations due to work or other scheduling obligations. Once your house is “market ready” and you and your agent or realtor have conducted the necessary research and accurately priced your home, it will be time to list your house! From the moment your agent lists your home for sale, you will be responsible for keeping your house clean at all times. If you and your agent have done a good job of pricing your home, you should be getting regular calls from other agents with potential buyers. You will often be given very short notice when buyers want to view your home, so you should make sure your home is ready to be shown at any time. As experienced Guelph real estate agent, we can help you prep, price and sell your home with ease! We have been helping people on the move for years and we can’t wait to do the same for you! The strategic marketing concept of holding open houses has been under scrutiny for quite some time. There are people who will swear by open houses and others who don’t believe open houses truly help when it comes to selling their Guelph real estate. It is true that most people looking to purchase their home will start their search online and this is a great way to start bringing attention to your property. With such an emphasis on online marketing it is hard to see the value in an open house, but trust us, it’s there! Have you ever made a purchase online before? What type of item did you purchase? It was most likely something you have purchased in the past or had already seen in a store. If most people are worried to purchase clothing online for fear of receiving the wrong size, they aren’t going to purchase a home strictly off what they read about it on a website. People want to experience the house. They want to check out the neighborhood as they drive up and picture their possessions as they walk through the house. An open house is the perfect way to let as many people as possible have these experiences and fall in love with your home. One of the most important aspects of holding your open house is selecting the right day and time. Open houses are now typically held for only a couple of hours, say from 2:00pm – 4:00pm. This strategy of limiting the hours will bring more people to your house in a shorter amount of time, giving them all the impression that there is heightened competition for your home. Choosing the right day is also an important factor when planning your open house. You don’t have to stick to the weekends if the buyers you want to target would be more likely to come by on say a Thursday. Take some time to think about the potential buyers you want to draw in and consider their usual movements, then work your open house plans to fit into their routines. It is very important to advertise your open house to draw as much attention and traffic to your home as possible. This can be accomplished with flyers and signs and via social media and word of mouth. Your agent or realtor should also have some marketing tools they can provide to ensure your open house is properly advertised. An open house doesn’t have to be a sort of informal home inspection. Make your open house more of a social event by inviting your neighbours. The potential buyers that come to your open house with this welcoming and friendly atmosphere from your neighbourhood will have a much better impression of your home. Holding two open houses is a great way to draw more potential buyers to your Guelph real estate. Hold one exclusive open house that is only for other agents and realtors. This open house won’t be advertised to the public, but your agent will be able to advertise it to other agents and realtors that represent potential buyers. It is important to get them excited about your property so they will take your information back to their clients. The second open house will be the open house you hold for the public and can be accomplished using the tips we have given above. If you are considering an open house, it is important to remember that online marketing and open houses don’t have to be either or. You can absolutely post your property online, with an agent or realtor, and hold an open house. These two marketing concepts go hand in hand and both are designed to increase your exposure to potential buyers. Do you want to hold an open house? Give us a call today and we will be happy to help! As with every industry, there are many common myths that are heard throughout the real estate industry. We are going to go through a few of those myths and explain why they are not facts as we help you through the process of selling your home. Myth Number 1: Selling your home FSBO will save you a ton of money. Many people believe that by selling their house “for sale by owner” they will be saving a ton of money by avoiding any fees associated with an agent, realtor or broker. There are many factors that these sellers are not considering, which could end up costing them far more in the long run. Yes, real estate professionals charge a fee or commission when they help you sell your home, but with that fee comes the expertise of that professional. They use their knowledge and experience of the industry to make sure you are listing your home for the right price and marketing your home the right way. They will also handle negotiations on your behalf and make sure all transactions and paperwork are handled legally and accurately. In doing so, these professionals not only save you money but also save you time! When it comes to one of the largest financial transactions you will make in your lifetime, don’t leave it up to chance. Hire a real estate professional who has the proper qualifications and can be trusted to handle the entire process ethically and in your best interest. Myth Number 2: Agents, Realtors or Brokers will say just about anything to make a sale. As we mentioned before, it is important to choose a real estate professional to help you sell your home who has your best interests in mind. Agents, Realtors, and Brokers are often portrayed as individuals who will say and do nearly anything to make a sale. This is not always the case, especially not with us! We hold ourselves to an even higher standard than the already strict code of ethics and regulations we are bound to as professionals in the industry. We strive to build lasting relationships with your clients and that would not be possible if we did not conduct ourselves with integrity. Of course, not everyone that works in the real estate industry operates the same way we do, so it is important for you to do your research and, again, make sure you trust the agent, realtor or broker before you hire them! Myth Number 3: Every Agent, Realtor, or Broker is the same. As we have already touched on, this is not the case. Unfortunately, this way of thinking can lead both buyers and sellers to choose the wrong real estate professional for their situation. Every agent, realtor, and broker have a different area of expertise, a different level of skill and a different personality. All of these factors should be taken into consideration when you are looking through your list of potential candidates. Just because someone has a real estate license, doesn’t mean they are necessarily qualified to provide what you are looking for. Myth Number 4: You should “leave room” for negotiating when you decide on an asking price for your home. Making sure your home is priced correctly is one of the most important requirements if you want to sell your home quickly and for as much as possible. Many sellers believe that if they price their home well above what they expect to sell it for, they are leaving room for buyers to feel like they are negotiating the price down and still come out where they want. This tactic is not advised because it will typically result in your home staying on the market for a longer period of time, during which you will most likely begin dropping the price anyway. Most buyers will be conducting their research online or working with a professional and will move right past a home that is significantly overpriced. Myth Number 5: You do not need to report the sale of your home. Along with the recent mortgage regulation changes, the Federal Finance Minister has also instituted tax changes that require all property sales to be reported by sellers to the Canada Revenue Agency. These practices have already gone into effect, requiring every seller to file a tax form in April that includes general information about the sale of the home. This may include acquisition and sale dates and a description of the property, among other information. While these five real estate myths may be commonly thought of as facts, we hope you now have a better understanding of how the real estate industry works and feel more confident in choosing us to help you sell your Guelph real estate! Give us a call today at (519) 831-7477 so we can help you on the move! Meet happy first-time homeowners, Meaghan and Kit! We are so honored to have been included in the process of finding their dream home! Whether you are looking to buy or sell your Guelph real estate, give us a call today. We can’t wait to help you get on the move! Are you looking to sell your Guelph real estate, but aren’t quite sure where to begin? The process of selling a home can be full of twists and turns and to make it easier on yourself, we recommend starting the journey by prepping your house for sale. As your trusted Guelph real estate agents, we want to help you sell your home as quickly as possible and for the highest amount we can get. Throughout our experience in the industry, one of the simplest ways to accomplish this is by using some of the following tips and tricks to dazzle potential buyers. Prepping your home may sound like an intimidating or expensive task, but it doesn’t have to be! We understand that expensive undertakings like remodeling or upgrading your home may not be possible for everyone so we have included ideas for every budget that can be used to prep your Guelph real estate for sale and recoup more of your original investment into your home. Make sure the exterior of your home is appealing to buyers. This could range from proper lawn maintenance and weed removal to planting new flowers and cleaning out your gutters. Another great way to instantly update the look of your home is to add a fresh coat of paint! Paint the front door a tasteful color that contrasts with the rest of your exterior and buy a brand new welcome mat to make your front entrance look more inviting. Repaint the interior as well. Whether you have young children who may have gotten your walls dirty or your current color palette is on the bolder, more colorful side, it is a good idea to freshen up the interior of your home with a great neutral color. This will make the house look cleaner as well as allow buyers to imagine their own decor and belongings in your home. Go ahead now and make any noticeable repairs to your home. While it may seem like a hassle to make these updates, you will be surprised how inexpensive a lot of the fixes can be and how much of an impact they will make with buyers. They won’t necessarily know how much each repair is going to cost them, so noticing a lot of things they will need to fix themselves could be a turn off for potential buyers. Clean, clean, clean, clean, clean! This is without a doubt the least expensive thing you can do to prep your house for sale and it often has the most impact! Make sure that every room and surface in your home are spotless. Even small things like organizing you closet and closing the lid of the toilet, can make a difference to buyers. It is also a great idea to remove clutter and personal items and try to arrange your furniture in a way that makes each room look as a large and inviting as possible. Make sure every room has a clear purpose. If you have a room you are using for storage, repurpose it into a bedroom, office or game room to show potential buyers that they too can find a use for that space. These are just a few, very simple, steps that can make the process of prepping your home a breeze. As you go through this list, add in the things you would be looking for as a buyer. Everyone is different and will appreciate different aspects of your home, so do your best to stay as neutral and simplistic as possible to help them to better picture themselves living in your home. It is also a great idea to turn on all your lights and bake something sweet when potential buyers are coming to view your house! This helps to highlight all the different areas of your home, and who doesn’t like the smell of freshly baked treats? As part of the outstanding customer service we provide to our clients, we offer a customized “Room-by-Room Review” to show you the very best things that you can do to prepare your house for sale and get the highest return on your investment! If you are in the market to sell your home, call us or request your “Room-by-Room Review” today! We can’t wait to get your home sold! Are you interested in purchasing a home, but have no idea where to start? As a Guelph real estate agent, we have gone through the home buying process countless times and are knowledgeable and experienced enough to help anyone on the move! Below you will find a list of the most common steps in the buying process and tips for working through them. The buying process begins by starting your search. There are many ways to begin the search for your dream home. You can search through listing in local newspapers and real estate magazines or search online with your computer or phone on websites such as Realtor.ca. The benefit of these online searches is that you can easily narrow down your search by applying filters to your results. While these tools can aid in your search, employing a Guelph real estate agent could make the difference between finding a house that works or finding your dream home. We have access to a larger database of homes and we are familiar with the process, so we know how to lead you in the right direction. Appliances, furniture, window dressings, etc. Once you have made an official Offer to Purchase, you will receive a response from the seller. There are two different responses the seller could make. The seller could accept your offer or the seller could send a counter-offer. If the seller accepts your offer, the buying process would continue to move forward. If the seller sends a counter-offer, negotiations could begin or you could decline their counter-offer and decide not to continue with the buying process. If you receive a counter-offer, keep your maximum price in mind so you don’t get caught up in the heat of negotiations and end up agreeing to more than you can afford. Once you and the seller have agreed upon the price and terms of the home sale, you would need to secure the financing for the house. For most, this means obtaining a mortgage. We advise getting pre-approved for a mortgage before you even begin your search for a home. This gives you a better idea of the home you can afford and your Guelph real estate agent a better idea of what your options are. A pre-approval also gives you more bargaining power when negotiating prices with sellers. Now you’re done and it’s time to move into your new home! As Guelph real estate agents, we are here to make the home buying process as stress-free and enjoyable as possible for you! If you are interested in buying a home this year, let’s start your search now and get you on the move! Call 519-831-7447 today for help finding your dream home!